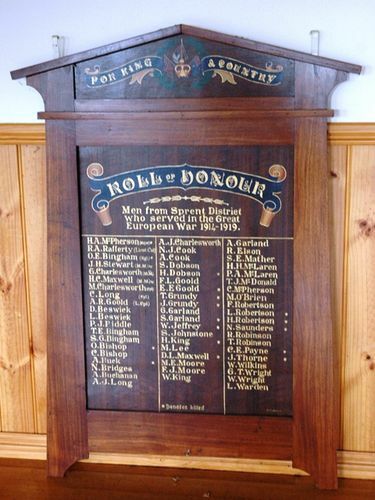 An honour roll commemorates those from the Sprent District who served in World War One. There was a large gathering at the Sprent Hall to witness the unveiling of the honor roll and distribution of medals to the parents and other relatives of fallen soldiers. The Warden unveiled the roll of honor, which contained the names of 59 men, 17 of whom had made the supreme sacrifice, and he extended to the relatives his deepest sympathy. The roll was the work of Mr. Fred Porter, of Ulverstone, and was greatly admired. Advocate (Burnie), 11th August 1919.